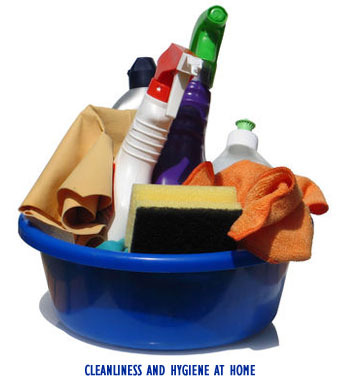 To maintain cleanliness and hygiene at home or your workplace should not be an issue when you know how to do it right. Cleanliness and Hygiene must be maintained if you want to live a healthy and hygienic life. There is a famous proverb, ‘health is wealth’; which means, if you are healthy then you are wealthy. Health is most important and if you are healthy, you can lead a happy life. You can enjoy good health if you maintain cleanliness and hygiene at home and your workplace. There are so many new diseases that are invading the human kind, and it is high time that you do not compromise with the hygiene of your home. Maintaining cleanliness and Hygiene is important and for that there are some good habits that need to be followed. It is your duty to make a clean and hygienic environment at home to lead a healthy, happy and enjoyable life. And as they say, precaution is always better than cure, and you can take necessary precautions to guard yourself against several deadly diseases which may be caused due to unhygienic environment. Irrespective of whether you use cleaning services from a housekeeping agency or do it yourself, here are some of the best ways to maintain cleanliness and hygiene at home. Do not leave buckets of water or opened container with water in or near your home, as these places serve as perfect environment for breeding mosquitoes causing fatal diseases. Clean the ceiling and the walls to remove spider webs. Do not forget to clean the blades of the fans as well. Dusting the carpets before you place them on the floor is needed. Wash the sofa covers and the cushions at regular intervals, like you can change them monthly. Clean the dust coating from the appliances and the furniture. Sometimes, crumbs of food items can fall on the sofa or couch when you eat there. Make sure you clean them immediately. The rooms must have enough windows to make entry of sun rays. Sunlight can kill millions of germ particles. If you have fish bowl, then change the water on a regular interval. Vacuum clean, sweep, or mop the floors regularly, doing it each day is preferable. If you have pets, then the rooms may get dirtier due their hairs or furs; make sure to clean that too. If you have kids at your home, then keeping the room is of primary importance. Change the curtains too as they tend to get dirty because they come in contact with the outside pollution. Always cover the foods with covers, do not keep them open, as foods attract several bugs like cockroaches. Check the drainage system, to avoid water logging in bathroom and also kitchen. Wash the plates after you have your meal, unwashed plates are the dens of germs. Clean the oil stains and the greasy sticky pans with washing soap, use less oil which is good for health and also the kitchen. Always use lid while cooking, cooking in pressure cooker is helpful. Make sure the chopping board, the knife, and the kitchen counters are cleaned properly before you use them. Wash the veggies before you cut them. Exhaust fans or kitchen vents are must to get rid of vapors and smells. Place trash cans in kitchen, and empty it after use. Installing an aquaguard or a water purifier is always advisable. Not only the water has to be purified, but also the containers where you will store water have to be clean. Your kitchen should have at least one window for ventilation. Keep your pets away from the kitchen space. The kitchen vents or the exhaust fans have to be cleaned within regular intervals as they get very dirty due to regular use. You can do servicing or clean these appliances by calling professionals. Use kitchen cleaners to clean the kitchen space, as it is found in several cases that the visibly clean areas are contaminated by germs. Ensure that the kitchen smells nice; you can use lemon extract or vinegar for this. Wash your hands well before you prepare food, and also before you eat it. Proper ventilation in bathroom is must. Clean the bathroom regularly, if not every day, then very frequently. Moisture causes mild dew in the bathroom, and from there several germs can appear. Clean the bathroom in hot water, hot water helps in killing all the germs like bacteria. The drainage should be efficient in bathroom, water logging must be avoided. The water that you use in home for daily chores is stored in overhead tank. Clean the overhead tank, at least once or twice the year. Food poisoning may cause if the water is not clean. Clean and then dry the towels of your bathroom. Dry the towels for few minutes before you go to bed. Then in the morning you can get fresh towels. If there are some small holes by the door or windows, then seal the holes immediately. Pests like ants or cockroaches can enter your home through these. To maintain hygiene at home, you must also clean yourself. Germs can enter your home by various means, and you may be the carrier of germs. So maintaining personal hygiene is also necessary. If you are a smoker, then do not smoke inside your home, go outside in the garden or balcony to smoke. The people around you who do not smoke can find it very uncomfortable if you do near them. The ashes can also fall in the room, polluting the room. Throw away the garbage only in the bins. Do not dump them inside the home, or outside the home in the streets. Garbage is the most suitable place for breeding various annoying bugs. Change the bed covers and the pillow covers regularly, at least once a month. There are some insecticides and insect repellant chemicals available in the market. You can use them, but make sure to keep them away from children. Trim the garden around your house. The unwanted weeds can be the home of several dangerous animals like snakes. And we have published a checklist for office cleaning that you must check.